The explosion in interest in fibre lasers in the past few years has served IPG Photonics very well. In spite of increased competition as other suppliers developed their own products, it has increased awareness of fibre laser technology to bring it very firmly into the mainstream. IPG Photonics was founded by Valentin Gapontsev in 1990, a Russian-born laser expert who had previously spent more than 25 years with the Soviet Academy of Sciences (SAS), which later became the Russian Academy of Science (RAS). When Gapontsev began at the SAS as a postgraduate in 1964, it was an exciting place to work – a network of science institutions packed with some of the world’s leading scientists. By 1972, Gapontsev had achieved a PhD in laser material science, specialising in the development of new solid-state laser materials. As the end of the 1980s loomed, opportunities at the RAS (as it was then known) were becoming limited, with too many scientists chasing too little funding. Gapontsev decided to make the break, and with the few thousand dollars that he’d managed to scrape together as savings over the years, started IPG Photonics in a small town near Moscow. 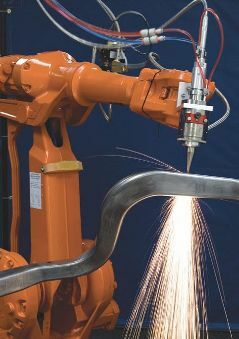 Alongside customised glass and crystal lasers, as well as laser components, the company began to develop high-power lasers based on fibre optics. Within a couple of years, Gapontsev realised the potential of fibre lasers, and concentrated all his efforts on developing the technology. During the first decade of IPG Photonics, most of the successful deployments of its fibre lasers were in the telecommunications field – deployments that came to an abrupt stop in 2000 as that market collapsed. In spite of the fact that revenue fell by nearly 60 per cent, IPG made a decision to invest what capital it had left in developing high-power products and, more specifically, in a high-volume production facility to make its own high-power pump diodes. This was to prove a key strategic decision for the company, as it enabled IPG to keep a tight control on the cost, quality and quantity of its own components, rather than rely on third-party suppliers. Indeed, it is exactly this set-up that ensures they remain more competitive than the relative newcomers to fibre lasers today. Shiner says that the quality of fibre lasers and their versatility means the products sell themselves, to a certain extent. ‘The attributes of a fibre laser include high wallplug efficiency, good beam diversity, compact design, and high brightness,’ he says. ‘Most importantly, though, it offers maintenance-free operation, and you don’t need to be a qualified photonics specialist to be able to use one. This leads to low cost of ownership. ‘Fibre lasers have really changed the paradigm. Before, people would only use lasers if they really had to. Now, their low cost of ownership and ease of operation makes them a viable alternative to a whole host of technologies. IPG Photonics now employs more than 1,500 people worldwide. As well as the corporate headquarters in Massachusetts, there are three other offices in the US, as well as facilities worldwide in Germany, Italy, UK, France, Russia, India, China, South Korea, Singapore and Japan. There is also a strong distribution network in other territories, the largest being Brazil and Mexico. The low cost of fibre lasers and ease of operation makes them a viable tool for all kinds of applications. The current crop of products emerging from IPG includes a new 532nm pulsed green laser, aimed at the photovoltaics and marking sectors. ‘Whenever we launch a new laser with fibre, it really changes the price envelope,’ says Shiner. ‘Previously, green lasers were very expensive, but with a fibre laser option, the cost of ownership comes down. ‘We’ve also launched a mid-pulsed laser, which competes against lamp-pumped lasers in applications such as welding a pacemaker. The explosion in interest in fibre lasers meant that several more players entered the market. ‘In the low power, q-switched lasers, we certainly have more competition, but then that’s a fairly easy product to manufacture,’ says Shiner. ‘The greatest cost in the manufacture of a fibre laser, though, is the diode. Since we make all our own diodes – and we’re the largest manufacturer of diodes in the world – we are at a great advantage in the higher power range where more diodes are required. Efficiencies included four-day working weeks at some sites, and cancelling of overtime, but unlike many others, there were no lay-offs of any significance. ‘Our last quarter was very good though, and we’re looking forward to a good year,’ says Shiner.